The majority of the following notes are taken from the Content Creation User Group (CCUG) meeting, held on Thursday, April 16th 2019 at 13:00 SLT. These meetings are chaired by Vir Linden, and agenda notes, meeting SLurl, etc, are usually available on the Content Creation User Group wiki page. The Estate Access Management (EAM) RC viewer, version 6.2.0.526190, dated April 12th, 2019 was promoted to the de facto release viewer on Wednesday, April 17th. See my EAM overview for more information. The Teranino Maintenance RC viewer updated to version 6.2.1.526357 on April 18th. EP RC viewer version 6.2.0.526104, April 11. Bakes on Mesh RC viewer, version 6.1.1.525409, March 26. 360 snapshot viewer, version 5.1.6.515934, June 6, 2018 (see my hands-on update). A set of environmental enhancements allowing the environment (sky, sun, moon, clouds, water settings) to be set region or parcel level, with support for up to 7 days per cycle and sky environments set by altitude. It uses a new set of inventory assets (Sky, Water, Day), and includes the ability to use custom Sun, Moon and cloud textures. The assets can be stored in inventory and traded through the Marketplace / exchanged with others, and can additionally be used in experiences. Due to performance issues, the initial implementation of EEP will not include certain atmospherics such as crepuscular rays (“God rays”). To make Animesh objects behave as much as possible like avatars. This might be done by issuing a command to load a given shape into an Animesh, or just have a similar appearance resolution to avatars, which would allow associations with body parts for any attachments contained within the Animesh’s contents. Advantage: either route offers the closest compatibility to the way in which avatars work, making it easy to port stuff over from using with avatars to using with Animesh (e.g. Animesh NPCs). This is a much more complex project to implement as it requires substantial changes to the Bake Service, which can be a performance bottleneck. So a concern is that adding Animesh support to the Bake Service could have a further adverse impact on its general performance. While applying a body shape could be done via the simulator (avoiding the Bake Service), but this again involves added complexity in the amount of asset information fetching the Simulator already has to do. An alternative approach would be to offer a more granular control, using LSL to set the values usually set by shape sliders. Advantages: It can reduce the complexity by allowing s subset of slider changes to be replicated via LSL (e.g. face, hands, etc), rather than trying to have the entire slider system replicated. Disadvantages: This doesn’t give the same level of compatibility to the way avatars work, and if all the sliders were required, it would add considerable additional work with LSL calls for the 130+ sliders. Which approach should be taken is down to whatever the most common use-case for customising Animesh might be (a likely topic for discussion). Currently, either approach will require additional server / viewer messaging, so Vir is looking at that. There are also questions on what else might be preferable to add to Animesh (e.g. extending Bakes on Mesh to support Animesh, adding attachments support, etc), and the relative priorities people place against the various options as to any order as to how things might be tackled (would applying shapes be sufficient? Should it be shapes then another requirement, or is there another requirement that should take priority over shape support?). Attachments are an issue in themselves; as Animesh doesn’t have an associated agent, there are no attachment tables for it to use, making basic attachment to s specified point difficult. Also, avatar attachments are effectively individual linksets applied to a common root – the avatar. However, as an Animesh object is a single linkset, adding attachment to one object is more akin “merging” the attachment’s linkset into that of the Animesh, making them one continuous linkset. This clearly add complications; for example, how do you identify all the parts of the attachment to remove them when detaching, and how do you ensure they detach as a single object, rather than a coalesced group of unlinked items?. One potential solution might be to have a means by which individual prims within the Animesh linkset can be flagged with an associated joint within the skeleton, thus allowing attachments to be made to that joint, and somehow “faking” the fact that the attachment linkset is not part of the Animesh linkset. Exactly how this would work in practice still has to be properly determined, together with an mechanism for handling local position and the attachment’s position and rotation offsets. It is further unclear at present whether this approach might required support from and additional viewer UI element or could be controlled entirely through LSL. Extending the current avatar baking service to allow wearable textures (skins, tattoos, clothing) to be applied directly to mesh bodies as well as system avatars. This involves viewer and server-side changes, including updating the baking service to support 1024×1024 textures, but does not include normal or specular map support, as these are not part of the existing Bake Service, nor are they recognised as system wearables. Adding materials support may be considered in the future. Bakes on Mesh knowledge base article. Bakes on Mesh forum thread. Bakes on Mesh JIRA filter (courtesy of Whirly Fizzle). Anchor Linden is dealing with issues related to handling alpha layers in the new baking channels – with dome of them not getting correctly baked, and which may need some fixes in the baking process. BUG-226599 is also being looked at; although a feature request, it might actually be the result of an underpinning bug. Following the April 11th CCUG, Cathy Foil carried out further tests to apply materials to a Bakes of Mesh surface. 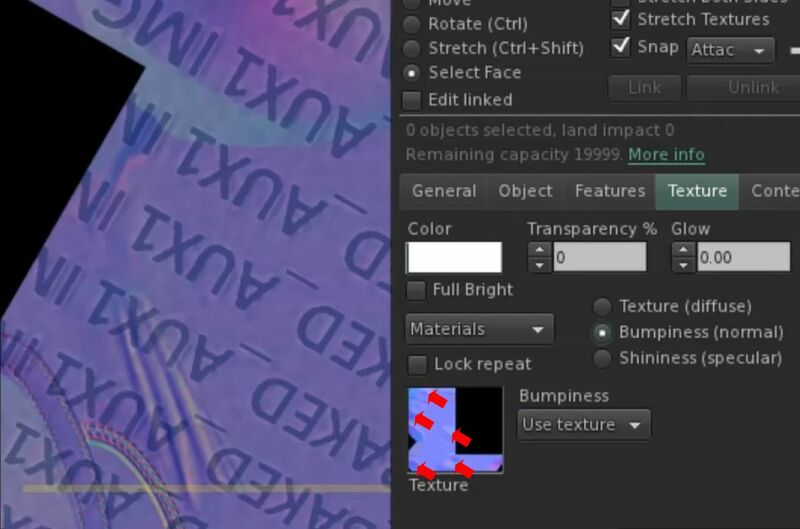 This involves using a script to take the UUID for one of the new universal bake channels (e.g.BAKED_ AUX1), and pointing it to a normal map (shown in the place holder normal map image “BAKED AUX1 IMG”, right), then wearing a universal wearable that uses the same bake channel. This results in the normal map then being applied to the desired face, as show in the image of the normal map in the Edit floater (arrowed on the right, above). This approach also appeared to allow a layering of normals on a face. However, the method is not currently seen as a recommended approach to materials with BoM, and probably won’t be treated as a supported technique. As always, please refer to the server deployment thread for updates and news. On Tuesday, April 9th the SLS (Main) channel was updated to server maintenance package 19#19.04.09.526122, previously deployed to the main RCs in week #15, and comprising logging improvements related to teleporting. RC deployments were still TBA/TBC at the time of writing; I’ll update when more information is available. Current Release version 6.1.1.525446, formerly the Love Me Render RC viewer, dated March 26, promoted April 2 NEW. Estate Access Management (EAM) RC viewer version 6.2.0.526190, April 12. EEP RC viewer version 6.2.0.526104, April 11. Teranino Maintenance RC viewer version 6.1.1.525401, March 20. It is anticipated the EAM release candidate viewer could be promoted to de facto release status this week. We have some good info on the underlying causes and are working on fixes, but don’t have a real improvement yet. it usually fails as the viewer and 2nd region don’t start communication properly, so I’ve been digging through that code and all the ways it can fail … that’s my life lately … I’m sure I’ll have something new for testing in a day or two so hopefully next week’s updates will be better, or at minimum give better information. I haven’t looked specifically at vehicles so I can’t say, but it’s possible, yes. I tried a boat trip around a new Linden Homes continent and it was a challenge, to put it politely. In the meantime, new code that might help relieve the issue was deployed to the Cake mini-RC channel on Tuesday, April 16th. Those wishing to test crossings on this channel can do so on the following regions: Morris, Arnthrud, Croak, Gouda, Impeller, Kasba, Oak Bay, Sapars, Yongma. Constructive feedback can be sent via IM or note card to Simon Linden. When testing, please wait around 2-3 minutes between each teleport to allow you to fully disconnect from the region you have just departed, particularly if you intend to just bounce back and forth between the same two regions (data is retained for a short time by a region you’ve just left, in case you want to rapidly want to TP back, and this data needs to be dropped during testing, as it can affect results). The following notes are taken from the TPV Developer meeting held on Friday, April 12th, 2019. A video of the meeting is embedded below, my thanks as always to North for recording and providing it. This was a relatively short meeting, with several periods of audio silence and text chat. The key points of discussion are provided below. The Estate Access Management (EAM) RC viewer updated to version 6.2.0.526190 on Friday, April 12th, 2019. As noted in my CCUG summary, the EEP viewer updated to version 6.2.0.526104 on Thursday, April 11th. With the necessary back-end updates now made, it looks likely that the EAM RC viewer will be the next viewer to be promoted to de facto release status. The Lab continues to try to understand the root cause(s) of the teleport disconnects. So far, they can only confirm it is not specific to any single viewer. As previously indicated in my updates, the root cause of the issue is a race condition / timing issue – something that could be exacerbated by the distance of a user from the Lab’s servers (the grater the distance = the more time required for communications = the greater the chance of a timing issue / race condition). Similarly, a high packet loss between viewer and simulator(s) might increase the chances of a disconnect occurring. The problem remains in trying to identify precisely what has changed to cause any race condition / timing issue. As noted in this week’s SUG meeting summary, there was a server RC deployment on Wednesday, April 10th – version 19#19.04.09.526122,. This included additional logging to help capture further data on the teleport disconnects, particularly capturing where the region handshaking may be failing. Multiple regions have been replicated on Aditi, and having further enhanced logging enabled on them. This additional logging capability may be deployed to Agni in week #16, but not necessarily enabled, due to the performance impact it will have. However, the code will be in place should it be required. The Lab now has a “solid” repro for this issue. As anticipated, much of the problem appears to be related to having too many scripted attachments stacked on the same attachment point (e.g. the right hand, the default attachment point, and often used by default by mesh clothing makers). However, the work on developing a fix has slowed as a result of resources being moved over to the teleport disconnect issue. As noted in my SUG summary, it appears the code for the Asset UDP messaging deprecation didn’t work as anticipated, likely the result of one code element failing to merge correct. There will be a be a further RC deployment in week #16 with the corrected code. A reminder that assuming the deployment is made and the code works as anticipated, anyone using very old viewers still reliant on UDP messaging for assets and which do not have support for HTTP messaging will not be able to receive any updates for the following: animations, body parts, clothing, gestures, landmarks, meshes and sounds whilst connected to regions on any RC channel. The are reports of issues with the EEP code interfering with Interest List culling, with Draw Distance having little effect on scene rendering (BUG-226752). This is being investigated. The following notes are taken from the Content Creation User Group (CCUG) meeting, held on Thursday, April 11th 2019 at 13:00 SLT. These meetings are chaired by Vir Linden, and agenda notes, meeting SLurl, etc, are usually available on the Content Creation User Group wiki page. The EEP RC viewer updated to version 6.2.0.526104 on Thursday, April 11th. A significant addition to the viewer with this release is the Personal Lighting floater. When opened, this floater takes a “snap” of the current shared environment (parcel or region / estate) you are in, and present you with a number of controls that allow you to make quick modifications to the environment that only you can see in your viewer, including Sun and Moon positions, ambient lighting cloud and sky colours, etc. These changes will persist until you log out or select World > Environment > Use Shared Environment, so you can close the floater once adjustments have been made. The new EEP Personal Lighting floater, designed with SL photographers and machinima makers in mind. This floater has been added in response to concerns raised that where No Modify EEP asset settings are applied to a location, photographers cannot alter the environment lighting, etc., in a manner to suit their needs, and as they’ve been accustomed to being able to do with windlight tools such as Phototools. Rider notes that this is a first pass at providing photographers / machinima makers with a suite of options that do not claim an unreasonable amount of screen real estate and fulfil the above requirement. However, if there are specific options photographers feel are needed, and which cannot be otherwise tweaked for EEP settings that are No Modify, please submit them as feature requests. Specularity Issues: the most recent versions of the viewer (nightly builds and the new RC update) contain an unwanted level of specularity, across objects and on Linden Water. Reports have / are being filed on this. The latest EEP RC has some issues with specularity rendering on objects (l) and circled right (compared with the same terrain mesh seen on the default viewer, centre). Bugs: Graham Linden continues to try to deal with the remaining shader bugs and clear them. Anchor Linden is attempting to characterise a couple of viewer bugs that might also require back-end updates as well. The viewer is also awaiting a merge with the latest release viewer (formerly the Love Me Render RC viewer). To manually apply materials directly to the mesh face in additional to BOM applying a worn composite. To apply materials to a mesh via a scripted means. This involves using a script to take the UUID for one of the new universal bake channels (e.g. AUX_1), and pointing it to a normal map, then wearing a universal wearable that uses the same bake channel (e.g. AUX-1). This results in the normal map then being applied to the universal. It’s also not an approach the Lab recommend, and probably won’t be treated as a supported technique. Vir has been working on impostor extents see BUG-226359). When impostors are enabled, they can get oddly cropped due to their bounding box size. The obvious fix is to increase the bounding box size for impostors; however, doing so comes at a performance cost when the viewer renders them – thus potentially negating their purpose (to reduce the render cost / performance hit in rendering complex avatars / Animesh). This likely means that any fix is going to be something of a balance between “padding” (enlarging) impostor bounding box sizes and allowing some truncation to avoid too big a viewer performance impact (fps) when rendering them. Update, April 10th: as per Bugsly Linden’s forum comment, the RC regions are receiving a maintenance update – 19#19.04.09.526122, which contains additional logging to help capture data on the region crossing issues. On Tuesday, April 9th the SLS (Main) channel was updated to server maintenance package 19#19.03.28.525781, comprising the simulator operating system update and EEP. The deployment thread states there is no planned deployment to the three main RC channels, and all three should remain on server maintenance package 19#19.03.28.525781. We’re doing last-minute discussions but will likely have updates out tomorrow in the RC channels. One won’t have any visible changes, but has some logging that might help sort out the region change issue [teleport disconnect?]. The other is a maintenance release, the most interesting thing there is some additions to llGetObjectDetails() that give Animesh information. I’ll update should the deployment thread be refreshed with new information. It was indicated in the week #14 deployment notes that 19#19.03.28.525781 would contain the removal of UDP Asset message handling from the simulator code, meaning that anyone using very old viewers still reliant on UDP messaging for assets will not be able to receive any updates for the following: animations, body parts, clothing, gestures, landmarks, meshes and sounds. I’m not sure what’s going on … it was _supposed_ to be disabled with the update that went to the full grid today. Current Release version 6.1.1.525446, formerly the Love Me Render RC viewer, dated March 26th, promoted April 2nd. Estate Access Management (EAM) RC viewer, version 6.2.0.525891, April 4th. EEP RC viewer version 6.2.0.525808, April 1st. Bakes on Mesh RC viewer, version 6.1.1.525409, March 26th. Teranino Maintenance RC viewer version 6.1.1.525401, March 20th. 360 snapshot viewer, version 5.1.6.515934, June 6th, 2018 (see my hands-on update). Obsolete platform viewer, version 3.7.28.300847, May 8th, 2015 – provided for users on Windows XP and OS X versions below 10.7. This viewer will remain available for as long as reasonable, but will not be updated with new features or bug fixes. Currently we know that the 2nd region and the viewer aren’t communicating as they should when it fails … it seems like you get transferred to the 2nd region OK, but the viewer just doesn’t get connected properly … The first region thinks all is well and it’s done, the 2nd gets the TP data but never starts talking right with the viewer. Following the Simulator User Group meeting, a stress test was attempted, with groups of people teleporting between a group of three regions, with mixed results (some reported disconnects, others had no issues). Older viewers have additionally been suffering with “regular” disconnects roughly every 15-minutes, which may be related to the deployment of the latest simulator operating system updates, and might be getting conflated with the teleport disconnects to some degree. However, for Singularity users, there are fixes in the works, and the suggestion is that, if possible, people try installing one of the more recent nightly builds. The following notes are taken from the Web User Group meeting held on Wednesday, April 3rd, 2019. These meetings are generally held monthly on a Wednesday at 14:00 SLT, and are chaired by Alexa and Grumpity Linden at Alexa’s barn. The focus is the Lab’s web properties, which include the Second Life website (including the blogs, Destination Guide, Maps, Search, the Knowledge base, etc. ), Place Pages, Landing Pages (and join flow for sign-ups), the Marketplace, and so on and the Lab’s own website at lindenlab.com. Resident-to-Resident Mainland Auctions: user-to-user auctions for Mainland parcels launched on March 26th – see the official blog post and my own report. The response has been exceptionally positive. New Linden Homes: samples of the first types of new Linden Homes due to be released “soon” are currently available to preview through until Sunday, April 7th. The preview is open to Premium and non-Premium account holders (although the houses, once available, will only be available to Premium account holders. You can read more about them, and the preview in my article New Linden Homes Preview. The Lab is currently working on the web site for the homes: the process flow for selecting and obtaining a new Linden Home, etc. SL.com: work has been carried out to fix broken direct SLurls, and work is in progress to further improve the new user flow, including the new starter avatars. Marketplace: it is believed the recent issues with Wish Lists and with gifting have been resolved. The message received by a user blocked by a Merchant has been revised to make the situation clearer. Issues with transaction histories not displaying correctly should be resolved. Work is continuing in preparing the MP for the return of last names / name changes. The most recent blog on Marketplace updates can be found in Second Life Winter Web Work, dated February 28th, 2019. I’ve covered the use of scripted tools that can make rapid and multiple changes to a user’s group tag display. These actually a) use a function in a way not intended; b) can put significant strain on back-end services (trying to propagate multiple group tag changes from multiple users across the grid). As noted in my previous notes on this, Linden Lab indicated they would be making back-end changes to reduce this issue, and as per their March 8th blog post on the subject, these updates have been deployed. As a result, many of these scripted animators have now been removed voluntarily by Merchants. However, those that have not been removed are going to be blocked. Merchants will be able to assign roles to their “managers” – what they can do, etc. So, for example, a Merchant can upload good to the MP, but assign a manager the ability to create and manage the actual listings for those goods. Actions taken by managers will be logged and fed back to the Merchant, so they can keep track of what is going on with their store. Once the current tranche of work on the Marketplace is closed-off, the web team will likely look at Events. This meeting marked the last for Alexa Linden as a Product Manager with direct involvement in the web services. She is going to be focused on the viewer and the server / simulator. Reed Linden will be stepping into her shoes with the Web services.